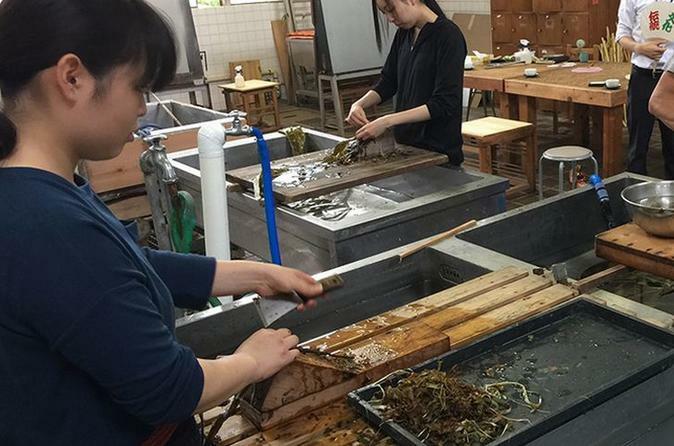 Let's visit Ogawamachi to make your own Washi paper (traditional Japanese paper) and visit a historical sake brewery. The key ingredients to making great sake is using high quality rice and water. The water used at the sake brewery you will visit is pumped from 130 metres underground. You will get a free taste of this water as well as a free sake tasting as part of the guided tour! You will first visit a local Hosokawa-shi workshop in Ogawamachi, where you will meet a Master of Hosokawa-shi making, designated by the Prefectural Government of Saitama. The history of washi craftsmanship in this Ogawamachi area dates back to the 8th century, and later it prospered as a specialty place for washi craftsmanship. At the workshop, you will learn how traditional washi paper is made through a guided demonstration tour. Then, you will be able to experience making your own washi paper using traditional tools and materials! Durability is a major feature of Hosokawa-shi paper. Special Offer - Book by March 31st, 2018 to save up to 50% off our previously offered price! - Book Now!